A archival video montage from the day Dow protests on October 18, 1967. The video shows: Students march down Bascom Hill sidewalk with protest signs reading Bring the Troops Home Now. Pan of students with protest signs reading Get Out of Vietnam. Closeup of young man singing, zoom out to lots of young men drumming and chanting. No sound. City of Madison police walk through large crowd of students, Carillon Tower in the background. Students are yelling something at them. Mustached student being led away by a helmeted policeman. Two more students being held and led away through the crowd by two policemen. Female student dressed as clown with a “sifting & winnowing” sign taped to her being loaded into a paddywagon by police. Crowd shot showing huge numbers of students reaching far back to a line of trees, policemen in foreground. Teargas is released in front of the Commerce Building, dispersing the students. Overhead shot at hundreds of students on Bascom hill, large trees, teargas dispersing the crowd. Chaos ensues as students flee. Fifty years ago the Dow Chemical protests brought everyday life on the UW–Madison campus to an abrupt halt. We caught up with six UW alumni, ordinary students whose lives were forever changed by that momentous day. Here’s what they had to say. Opposition to the Vietnam War had been building on college campuses for years when, on Oct. 18, 1967, UW–Madison students amassed to protest the recruiting efforts on campus of the Dow Chemical Company. The company made napalm, a flammable gel used on the battlefield by the U.S. government. What began as a peaceful act of civil disobedience turned violent as city police officers with riot sticks forcibly removed students from the Commerce Building (today’s Ingraham Hall), where they were blocking the Dow interviews. The clash involved thousands and injured dozens, hardened campus relationships, and became a catalyst for a new wave of emboldened pacifists. 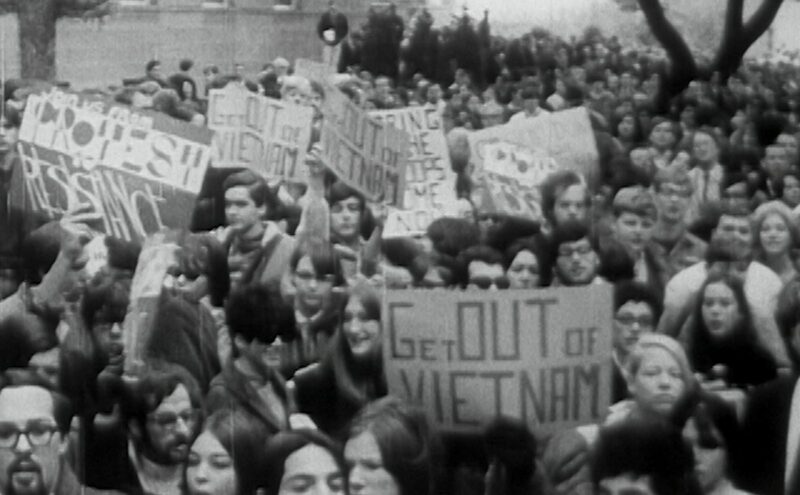 Demonstrations against Dow had begun the prior winter, but it was the fall 1967 conflict that propelled Madison to the forefront of the national antiwar movement. It was the first protest at a major university to turn violent, and it was the first time tear gas was used to disperse a crowd on the UW–Madison campus. Protests would continue to roil UW–Madison for years to come, increasing in frequency and intensity.